We bring together nurturing educators with vast experience in education, curriculum development, Jewish education and Hebrew language. Our teachers have advanced degrees and experience working with children who have a diversity of learning skills. 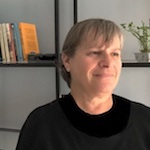 Orna Eldor Gerling, our founding executive director, brings a distinguished career of innovation in informal Jewish education on three continents. A native Israeli, she worked for twenty years in afterschool programs, language immersion camps, and arts camps. Her administrative experience includes directing multiple education and social service agencies in Israel, and leading a network of 180 Jewish community centers in the former Soviet Union. Orna holds a bachelor’s degree from Tel-Aviv University, a teaching certificate from the Beit Berl Arts Academy in Kfar Sava, Israel, and a certificate from nonprofit management from Georgetown University. Her two children attend Moed, and she lives with her family in Chevy Chase. Her direct email is orna@moedcommunity.org. Dr. Michal Krupnik-Gottlieb, the director of our North Bethesda branch, is on leave from her position as the head of the School for the Gifted and Talented at Oranim. Michal has also been a lecturer and researcher at Oranim Academic College of Education since 1998. She has been teaching graduate courses related to Gifted and Talented Education, and Science Education and conducting research in these fields. Michal is a Neurobiologist with a Ph.D. from the Technion – Israel Institute of Technology in Brain research, focusing on learning and memory. In addition, she holds a Master's degree in Science Education from The Ohio State University. She lived in Columbus OH for four years and at that time she also taught Hebrew for young children in a Sunday school. Daria Semchenkova is our Lead Educator and K-1 teacher. Daria was born in Russia and got her first degree in Philology and Teaching of Hebrew and English from the Academy n.a. Maimonides, Moscow. In 2014 she graduated from the University of Maryland with an M.Ed. degree in Curriculum and Instruction with a specialization in Hebrew pedagogy, having accumulated over 5 years of teaching experience in various settings and to different ages, over 7 years of research experience in education and language acquisition and almost 6 years of administrative work and events coordination at the Moscow JCC. Daria spent a year at the Hebrew University of Jerusalem (visiting fellowship), working on an independent research project and since 2007 has actively participated in several educational trips, workshops and conferences in Judaics and Hebrew teaching in Israel. Ety Abel has more than 25 years of experience as a kindergarten teacher in Tel Aviv, Ashdod, and Nahariya. Jonathan was born in the United States and grew up in Israel. In 2016 he got a bachelor's degree in applied linguistics from Georgia State University. As a bilingual native, his main area of interest is the process of second language acquisition. He lived in Atlanta, GA before moving to Portland, OR, and then relocating to Maryland. Ayelet Levi is our Israeli shlicha. She was born and raised in Ra'anana (a city near Tel Aviv). In the last three years Ayelet has lived in Beer Sheva, known as "the capital of the Negev." She is a a B.A. student, studying Politics & Government, Media Studies, and European Politics and Society. After high school, Ayelet participated in a year of service in the "Wizo Nir Haemek" boarding school and youth village, after which she was recruited to the IDF. She served as a guide commander in "NATIV," a Jewish Zionist identity course, under the educational unit of the IDF. Kate Bailey, our administrative coordinator, is a Ph.D. student in Jewish history at the University of Maryland, College Park. Kate received her B.A. in Judaic Studies from the George Washington University. Between receiving her B.A. and graduate school, Kate worked for four years in the DC Jewish community. She lives in downtown Silver Spring with her partner, Alan, and their Black Lab, Melvin. She can be reached at katebaileymoed@gmail.com.